France  2007  94m   Directed by: Julien Leclercq.  Starring: Albert Dupontel, Marie Guillard, Marthe Keller, Mélanie Thierry, Claude Perron, Alain Figlarz, Smadi Wolfman, Patrick Bauchau, Guy Lecluyse, Cyril Lecomte, Francis Renaud, Manon Chevallier, Estelle Lefébure.  Music by: Jean-Jacques Hertz, François Roy. A by-the-numbers cop movie with sci-fi elements, this French policier felt very tired than being the fresh, slick thriller it so wanted to be. Loud gunshots, car crashes and fist fights are utilized as an attempt to break up the monotony of the script by Leclerq, Nicolas Peufaillit, Franck Philippon, and Aude Py (yes, it took four people to write this film when it felt like one person could have written it in their sleep). Plugging into the generic lead role this time out are Albert Dupontel as David Hoffman, the take-no-prisoners cop who'd rather get the job done right than follow procedure. Hoffman looses not only his partner in the opening gun battle but his wife as well. Now it's personal...times deux. He's partnered with the well-meaning newbie Marie Becker (Marie Guillard) and the two work to find the truth behind a series of deaths. Of course, these murders are ultimately tied back to the fateful opening gunfight and to the plot of Doctor Brugen (Marthe Keller) helping her daughter regain her memories after a tragic auto accident. The large, gleaming neon sign points out the insidious mucky-muck plot device of a terrible weapon that's fallen into the wrong hands. Think "Project Janus" of JUDGE DREDD or any other number of government-funded weapons that have gone awry. This time it's a set of head gear that can download, erase, or implant memories into a subject. As government stooge Patrick Bachau (producer of CHRYSALIS) explains to his niece, Marie, the Chrysalis machine could be used to implant the memory of a fervent jihadist into innocent minds to create an army of terror killers. Likewise, a powerful business man could go on living forever by putting his mind into a younger body. If you just thought of FREEJACK, you're not alone. The only scene missing from CHRYSALIS is the rewriting of Hoffman's memories and his struggle to maintain his identity. (That might not be in the film but the scene of him handing over his gun and his badge is!) Rather, Hoffman's mind is wiped. This may actually be a good thing as it removes the demons of his haunted past and allows Maria the chance to be the weak protagonist for a while. Things shake out just as you know they will. There's even a "the media will love this" scene with Guillard and Bachau at the end. 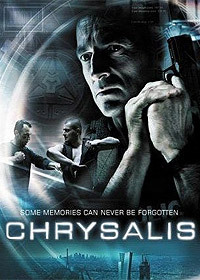 CHRYSALIS isn't a bad film so much as it's misleading. It's a light snack that pretends to be a three course meal. Review by cashiersducinemart from the Internet Movie Database.